QuakeFinder started a new magnetometer network in Chile in January. Why Chile? There are lots of earthquakes in Chile! Chile had the world’s largest recorded earthquake in modern history—a M9.5 near Valpariso in May of 1960 (greater than Sumatra, Japan, and Haiti)and it generated a 38 ft tsunami. 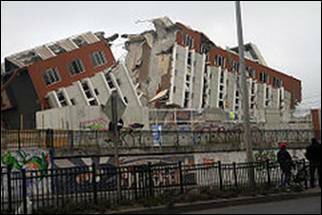 More recently, Chile had another M8.8 in Feb 2010, between Santiago and Conception, with some of the damage shown in the picture below. …to lush forest area near Conception. 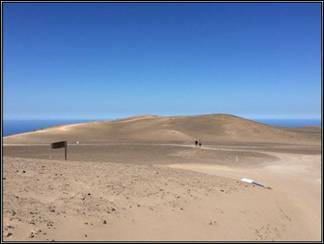 We received great cooperation from the 4 different groups at the 4 sites, and we hope this will be the start of a long and scientifically beneficial relationship in Chile. There was a major earthquake (M6.9) off the northern coast of California on Sunday, March 9, 2014, about 50 miles west of Eureka. QuakeFinder has several sites near the north coast. The closest site, Ferndale (site number 830) is located 47 miles east of the epicenter (which was near the “Triple Junction” of 3 fault lines). Although our anticipated range of detection for precursor signals is approximately 10 miles, we performed a preliminary analysis of our data (including from 6 additional nearby sites) to determine if there were any subtle indications before the quake. So far, as expected, we have not seen any indications in the data. Analysis continues.